(Newser) – Finally: the health benefits of a blueberry in the shape of a tomato. That's how researchers are billing a genetically-modified purple tomato that may soon be available to shoppers. "With these purple tomatoes you can get the same compounds that are present in blueberries and cranberries that give them their health benefits—but you can apply them to foods that people actually eat in significant amounts and are reasonably affordable," says Cathie Martin of the John Innes Centre. 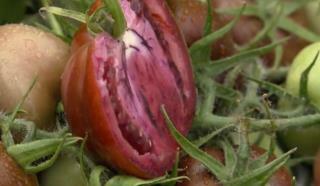 Research has suggested the tomatoes—which have double the shelf life of their red counterparts—could help fight cancer. If you really want organic material people will eat in droves, why not cross sugar cane and sugar beets? It's "Kellogg's Sugar Bane"... a part of a nutrious breakfast. naturally crossbreed it with beets and I'll buy it. Just because you can make Frankenfood does not mean you should.